Bulls Book Bus is coming to a spot near you! BISD is proud to share their love of reading with students over the summer. The Bulls Book Bus will begin it's adventure on Wednesday, July 13 and again on Monday, Aug 1. BHS Varsity Cheerleaders invite you to "Mini" Camp on July 21-22. The camp is for ages 4 years - 8th Grade (2016-17 school year). Click the Mini Cheer Camp title to view the registration form. Physicals for athletes will be held on July 19. The State Board of Education (SBOE) is issuing a survey in English and Spanish to seek public input about the state's current assessment and accountability programs. Let your voice be heard. Come Teach With Us in Wise County! 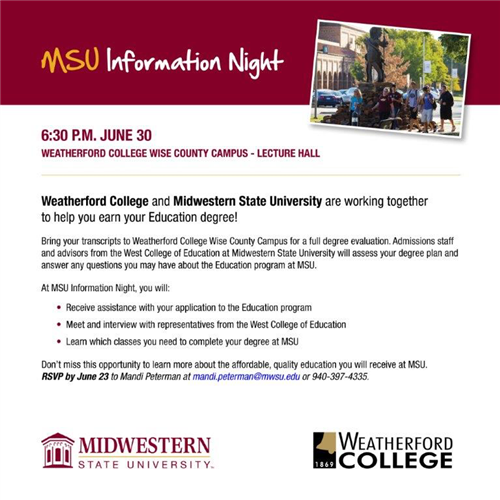 Weatherford College and Midwestern State University are working together to help you earn your Education degree! There will be an informational meeting held at Weatherford College Wise county Campus on June 30 at 6:30pm.